The Nelson U16 Selects Girls started the 2016 season on the right foot with a championship run at the annual Kelowna Icebreaker Tournament. Mar. 28, 2016 12:00 p.m.
Nelson U16 Selects midfielder Emily Taylor was a force all weekend at the annual Kelowna Icebreaker Tournament where the locals captured the gold medal. The Nelson U16 Selects Girls started the 2016 season on the right foot with a championship run at the annual Kelowna Icebreaker Tournament over the Easter weekend. The girls put together a perfect 4-0 round-robin record where they outscored opponents 12-0 to earn a spot in the gold medal final. In a soggy championship match, the Selects outlasted Vernon United 2-1 to claim the tournament title. The Selects started the tournament against regional rival Kootenay South Storm on Friday afternoon. Midway through the first half, Nelson midfielder Emily Taylor was presented a free kick just outside the 18-yard box and fired a top corner laser for the 1-0 lead. Taylor added her second goal of the game just as the first half ended to give Nelson a 2-0 advantage they did not relinquish. In the second game of the day against Vernon United, Nelson striker Shianne Michalchuk got into the action when she took a nice pass from Sophia Arcuri and fired a successful low shot just over two minutes into the game. Reece Hunt increased the lead less than 10 minutes later when she finished a nice play that started from the defensive end. Taylor rounded out the scoring late in the first half with a brilliant run down the left side and a cross that bounced off a defender and in. The Selects held onto their 3-0 first half lead for the win. Early Saturday morning, the Selects were matched against a gritty Prince George Timberwolves squad who kept the Nelson attack at bay until late in the first half when midfielder Lucy Fox finished a nice play with a low shot in close. Midway through the second half, striker Ali D’Odorico battled through the middle for the game’s second goal. Just before the final whistle, defender Ashley Hall lobbed a shot from 30 yards out that breezed over the Timberwolves goaltender to round out the 3-0 victory. In the final round robin game against the Rutland Soccer’s U16s, D’Odorico and Jodi Surina scored in the first half with defender Julia Burkart scoring on a penalty kick and D’Odorico rounding out the 4-0 win. In a rainy final game Sunday afternoon, Vernon United was a different team than in the previous game and gave the Selects a spirited effort. Just over seven minutes into the game, Arcuri made a nice through pass to Taylor who crossed into the six-yard box for D’Odorico who finished the play for a 1-0 lead. A rare Nelson defensive breakdown early in the second half resulted in the first goal in the tournament against the Selects and sent the game into a 1-1 tie. The second half continued back-and-forth with both sides battling hard in the mucky conditions. Eighteen minutes into the half, Taylor was fouled just outside the 18-yard box. On the free kick Taylor fired a perfect cross into the middle of the box where D’Odorico hit a perfect volley into the Vernon net for the eventual game-winning goal. With Vernon continuing to press with time running out, Nelson goalkeeper Hanna Quinn made the stop of the tournament when she came sliding out to the edge of the 18-yard box to secure the ball and preserve the lead. 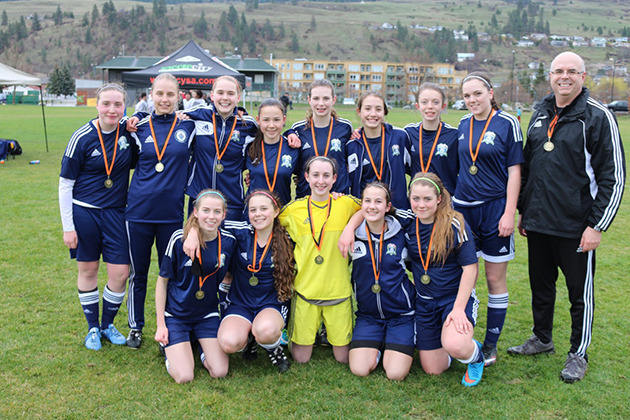 Nelson U16’s next action will be at the Kamloops Slurpee Cup in May. Below: The Nelson U16 Selects Girls captured gold at the annual Kelowna Icebreaker Tournament. The squad includes: (back L-R) Bella Guderyan, Anna Milde, Julia Burkart, Emily Taylor, Jodi Surina, Mimi Lockhurst, Lucy Fox, Ali D’Odorico, coach Paul Burkart; (front L-R) Ashley Hall, Sophia Arcuri, Hanna Quinn, Allison Bendis and Shianne Michalchuk.